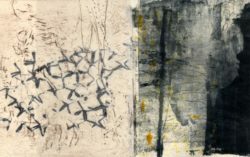 In this workshop we will create repeatable drypoint plates that can be layered together with color monotype plates. To warm-up on the first day we will begin with guided mark-making experiences which will serve as the basis for making drypoint lines into plastic plates. These plates will be inked in an intaglio manner and printed on rag papers. With the introduction of a colorful monotype plate, experimental moments of composing variations between these two techniques will be explored. Playful juxtapositions of line and color guide this inquiry.